iOS Transfer helps you Transfer contacts, SMS and more to iPhone/iPad/iPod touch/Android devices. Transfer contacts, SMS, photos, music, video, and more on your iPhone and iPad. 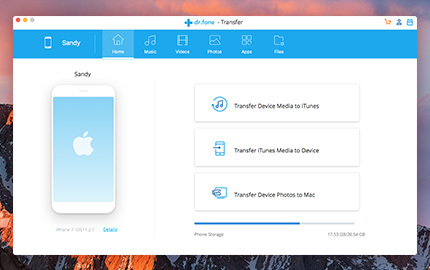 No matter you have more than one device or just want to change your old device with a new one, you can use this program to selectively transfer your data between your iPhone and iPad. It makes the transfer of your data much easier than ever. Connecting your iPhone/iPad and choose the data you want to save, the exporting and importing process will start by itself. Besides, you can get access to every corner of your mobile device under Disk Mode. You can transfer data between iOS devices selectively. For all treasure photos and videos, you can preview and select the ones you want to save and transfer them between iPhones, iPads and computers with ease. You can browse and freely transfer all files and folders on your iPhone and iPad. View what you want. You can selectively export and back up your apps as a batch. You can delete the data from your iPhone and iPad if you don't want to keep them, and you can transfer them to other iPhone/iPad devices or computers when there is such a need. It can be done within one click.